In a few days we begin the holiest days of the year, the Sacred Triduum. In planning for Holy Week, my first thoughts go to menu planning. Is it good that I'll be doing extra things in the kitchen to prepare for Holy Week? Am I being more of a Martha than Mary and detracting from the feast? I watched Joanna Bogle's Feasts and Seasons on EWTN and she also mentioned something about being in the kitchen more during holydays such as Holy Week than the rest of the year. She had an opposite opinion and allayed my fears — spending the extra time making these treats for the holy days marks the time and food as special, unique. She said it more eloquently, but it made me feel more confident to continue. Holy Thursday is marked with many food traditions. I'm sharing my Holy Thursday meal traditions, but also wanted to mention a few cultural ones from around the world. Maundy Thursday (le mande; Thursday of the Mandatum) — The word Mandatum means "commandment." This name is taken from the first words sung at the ceremony of the washing of the feet, "A new commandment I give you" (John 13, 34); also from the commandment of Christ that we should imitate His loving humility in the washing of the feet (John 13, 14-17). Thus the term Mandatum (maundy) was applied to the rite of the feet-washing on this day. Green Thursday — In all German-speaking countries people call Maundy Thursday by this name (Gründonnerstag). From Germany the term was adopted by the Slavic nations (zeleny ctvrtek) and in Hungary (zold csutortok). Scholars explain its origin from the old German word grunen (to mourn) which was later corrupted into grün (green). Another explanation is that in many places, before the thirteenth century, green vestments were used for the Mass that day. Holy or Great Thursday — The meaning of this title is obvious since it is the one Thursday of the year on which the sacred events of Christ's Passion are celebrated. The English-speaking nations and the people of the Latin countries use the term "Holy," while the Slavic populations generally apply the title "Great." The Ukrainians call it also the "Thursday of the Passion." In the Greek Church it is called "The Holy and Great Thursday of the Mystic Supper." In some Latin countries sugared almonds are eaten by everybody on Maundy Thursday. From this custom it bears the name "Almond Day" in the Azores. In central Europe the name "Green Thursday" inspired a tradition of eating green things. The main meal starts with a soup of green herbs, followed by a bowl of spinach with boiled or fried eggs, and meat with dishes of various green salads. And three spoonfuls of honey. "Judasas" are served with honey at breakfast in Czechoslovakia. These are breakfast cakes of twisted dough, made to look like rope, suggesting the fate of Judas the Betrayer, who "went and hanged himself" in remorse after he had identified Jesus to His enemies. Honey is considered a preventive against disaster (p. 58). I have searched through all my books and on the Internet, and I cannot find any recipes for Judases in the English language and measurements. If I had the Czechoslovakian word perhaps I would have better luck. It has been mentioned as a bread, sometimes cake, but no recipe. Update 2015: I did find a few recipes, one which I posted here: Judases. Anna also shared a link to a recipe in the comments, Judas Rope. Jennifer Mackintosh already mentioned the tradition of eating green for Green Thursday, including a wonderful recipe for Spinach Pie. Evelyn Vitz in A Continual Feast suggests a Seven-Herb Vichyssoise, and fish with a green herb butter, spinach, a mixed green salad, and green desserts such as Mint or Pistachio Ice Cream or Lime Sherbet. The custom of the green foods can be traced to the Jewish Passover meal with the bitter herbs, but also a health focus, as spring is arriving, and the green herbs provide a healthy spring cleansing. Since some people serve all green meals on St. Patrick's Day, that would be another place for inspiration for serving green foods. Since I was a young girl my family has gathered to celebrate a Holy Thursday meal. We never called it a Seder, although we have called it a Passover meal. The purpose was to remember Jesus' Last Supper, and to prepare the family for participation at the evening Mass of the Lord's Supper. I did try to learn more about the Jewish Seder meal, and over the years we would try to be more "authentic". But I have to say the men in my family were always a good barometer -- "Why are we doing this? We're not Jewish." They pointed out that we are Catholics trying to recall Jesus' last days, not trying to practice the Jewish faith. I found in my reading that the current Seder meal wasn't established until after 70 A.D., and many sources say not until 500 years after Christ's death. After prayerful consideration, why would we implement a ritual that was written after Christ that emphasizes awaiting the Messiah when He has already come? Wouldn't it make more sense to look back at the Old and New Testaments and imitate what Jesus the Messiah did at His Last Supper? It was interesting to study, butI realized I wasn't sharing the night with Christ. I respect the Jewish religious ritual of a Seder meal, but not as something to implement in my home. I used the Old Testament and New Testaments as inspiration. 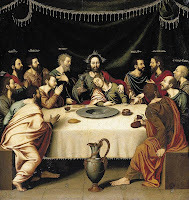 Francis Fernandez (In Conversation With God, Volume 2) mentions that the Last Supper is "to be the last Jewish Passover and the first Passover in which her Son is both Priest and Victim" (p. 252). (See also The Hunt for the Fourth Cup by Dr. Scott Hahn.) I want to look forward to the Paschal Feast, which is the Mass, and particularly the Easter Vigil liturgy. The "Christian Seder" or Passover meal on Holy Thursday has become popular in some circles in the past few decades. I have attended such dinners and have even tried to put one on myself. I enjoyed learning more about the Jewish Passover traditions as Our Lord observed them -- the symbolic foods, the toasts, the questions and the beautiful Jewish blessing prayers. Yet my own sense is that too closely to imitate a Jewish Passover rings falsely at my table. Our Holy Thursday menu does include some symbolic foods from the Passover meal. We read about both the Exodus of Jews and the story of the Last Supper, but we do not imitate the narrative and blessings from the Jewish observance. Instead, we try to concentrate on the fulfillment of the Passover in Jesus. Through His blood, He has saved us from death. And in the Holy Eucharist, He feeds us with His own flesh and blood. The high point of our Holy Thursday observance is our participation in the true carrying on of that last Passover meal. No re-enactment around our table, no matter how authentic, can compare with the Truth that we encounter in the Holy Sacrifice of the Mass. In many homes the memory of the Last Supper is brought out by the arrangement of the main meal in the evening. Of late the custom has been suggested in various books and pamphlets, of imitating the ancient Passover meal even in its details. A yearling lamb is to be roasted and served with bitter herbs and a brown sauce. Jewish matzos, together with wine, are to be distributed by the father in silence to all members of the family, thus commemorating the institution of the Blessed Sacrament. The use of some pious "ritual" at the supper on Holy Thursday is surely to be recommended, although a complete I imitation of the Last Supper of our Lord in its details does not seem to be advisable. Children, with their gift of keen and faithful observation, might easily conceive the ritual at the family table as a "photographic" reproduction of the Last Supper and thus acquire inaccurate and unhistorical notions about it. To mention only one example, are we sure that Christ used massah (unleavened bread) of the shape and size of modern Jewish "matzos". Whenever I hear Peter and John asking the Lord, "Where wilt Thou that we prepare the Pasch?" I want to interrupt and say, "Come to our house, please do." But even today we, as Catholics, can bring Christ and His friends home with us. When we receive the Holy Eucharist on Maundy Thursday, He lives within us. When we gather guests at our tables to re-enact the last supper, Christ is in our midst. For, as the antiphon of Holy Thursday sings, "where charity and love are, there is God." There is a divine bond between our altar and our home. Holy Thursday celebrates the institution of the Sacrament of the Eucharist and the Sacrament of Holy Orders. The Eucharist was established within the Passover meal by Jesus with His Apostles. A wonderful way to bring home the richness of this feast is to imitate the Last Supper by recalling some aspects of the Passover meal, and a foot washing ceremony with the family in imitation of Jesus. This a wonderful tradition to start in the family. If things are rushed on Holy Thursday, move the meal sometime before Holy Thursday (Wednesday night, for example) so that the whole family can participate in imitating Christ at the Last Supper. The idea is serving foods reminiscent of the Passover meal as the Jews did in Egypt and Christ did in imitation of the Exodus, not in imitation of Judaic religion. Elements of the Mass of the Lord's Supper are included to prepare us for participation at the Mass of the Lord's Supper. Incorporating the various senses in this meal really helps active participation, particularly for children. Holy Thursday is one of the biggest feasts in the Church year, since it commemorates the institution of Holy Orders and of the Holy Eucharist. Sunday-best should be worn by participants and the table should be beautifully decorated, with a white tablecloth (in imitation of the white vestments used at Mass) and even the good china and silver. For dessert (since this is a special feast day, no Lenten abstaining here), at times I have baked a cake in the shape of a lamb (there are numerous types of lamb molds available at craft stores or baking supply stores). Before or during the dinner, we read from Exodus 12:1-20 —- the story of the first Passover. Then someone reads from the New Testament reading about the Last Supper and the institution of the Eucharist rom either Matt 26:17:30; Mark 14:12-26 or Luke 22:7-20. These ideas loosely follow the instructions in Exodus, "A lamb...a year-old male lamb without blemish...That same night they shall eat its roasted flesh with unleavened bread and bitter herbs...."
Our family doesn't like the taste of lamb, so I'm actually serving roast beef. It looks similar to lamb. It seems Holy Week has extra constraints, so while I want to make a festive meal, sometimes time, energy, (and nowadays) and budget is lacking. One year my mother actually made a meatloaf in the lamb cake mold pan. It was definitely memorable. We usually save making the lamb cake for Easter. I usually choose a dessert that won't have leftovers to taunt us during Good Friday. Depending on my time, I might make unleavened bread, following Maria von Trapp's recipe. If I use regular bread it will be small individual loaves at each place setting. For my son with food allergies, I will serve gluten free bread sticks. Another alternative is serving Hot Cross Buns, again, following Maria Von Trapp's recipe. Before eating, the family gathers for the "Washing of the Feet", which I've described on my blog. The children are reminded that this meal is different than what the Jews celebrate because Christ already died and saved us, so we are not still awaiting a Messiah. We are not obliged to follow the directives for the Passover meal, we are merely doing it in imitation of Christ, so we can use all of our senses to know, love and serve Christ. While eating the reading from Exodus 12: 1-20, the story of the First Passover, is read out loud. This is the same first reading at the Mass of the Lord's Supper. Amazing amount of information - lots of new ideas. Thanks. This is a beautiful description of Holy Thursday, Jenn! I particularly love your ideas for the meal...though the meatloaf baked in the lamb cake pan would surely be met with suspicious eyes here! :) lol! So much wonderful background information here. Thanks! Fascinating post! And thank you for posting ahead of the actual feast days...it gives us time to plan. Thank you, Jenn! Great post for ideas and reflection. And, yes....thank you for posting in advance of the feast day!! What a terrific amount of information. I love the realness in your celebration of the Last Supper. You are so right in remembering the Last Supper and not trying to perfectly imitate it. We always make unleavened bread which is a family favorite and have green salad served with roast beef. I'm looking forward to linking over to your washing of the feet post. Thanks for all you do for the Catholic community. Why is there not a list on the right any more where we can access the different feast days? Anonymous ~ The list is still there, towards the top of the right sidebar. I haven't had a chance to put together a list for April, but hope to do so soon. Thanks so much for this great Holy Thursday meal. My husband got a hoot out of my lamb shaped meatloaf, for bitter herbs I did cooked spinach and for unleavened bread I bought some of that new flatbread at the grocery store in the "olive and rosemary" variety. It was meaningful to then go to mass and hear reading and my children were able to relate. Thanks again! Thank you. I'm glad you all found it helpful. It's been a blessing for our family over the years. Our boys definitely enter more deeply into the Holy Thursday Mass when they recognize the readings and actions. I love all your suggestions! I took a few of them, along with other items that were traditionally celebrated at a Seder, and incorporated them into a printable vintage menu for our guests (we host a Holy Thursday meal each year). Thank you! Thanks for all of this great info - I'm still a "newbie" to the Faith and am trying hard to establish traditions for our young family. Anna, Thank you!!!!! I'm going to add that link to the post!